Bat Zuppel is a band from Pittsburgh that I never seem to catch and have tried to book a few times. I did actually catch them recently at RANT 2017. You could make a comparison to an eel or something, but, after listening to their new album, Dylar, it seems that they must dwell someplace that is not exactly of this Earth. The album cover is way out there to start. It's colorless with a white, many-eyed creature being carried away in a wheel-barrow by a hooded figure in black. The cluttered cityscape behind sort of looks like Pittsburgh, hills and a trolley track and radio towers and smoke. The font on the cover looks nice, and the overall design recalls Peter Max's psychedelic worlds drained of their color. 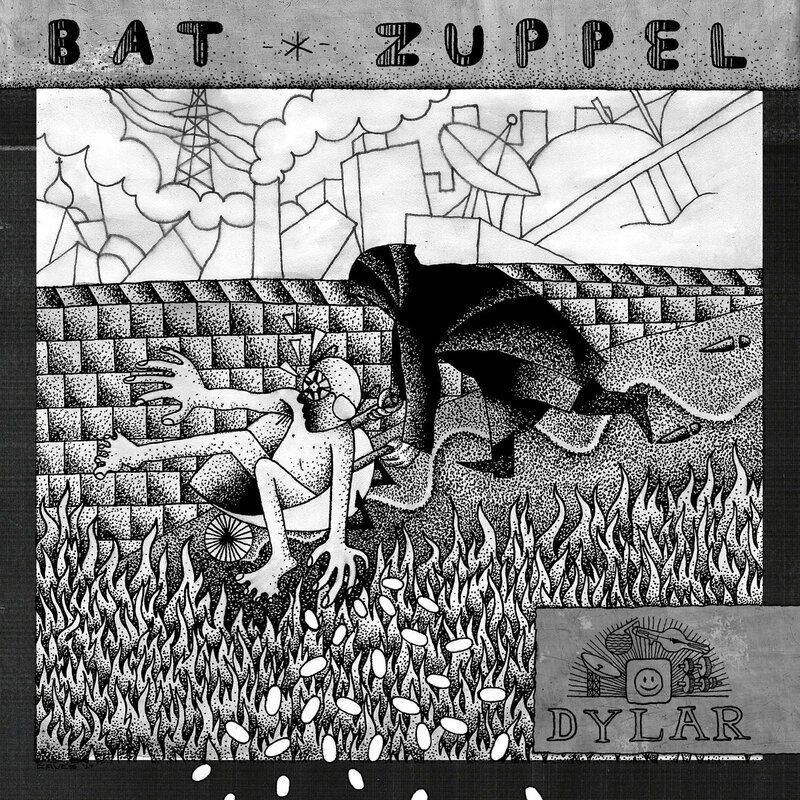 Dylar starts strong with "Dylar VII". The production is muddy, but it works. The song has a heavy-psych vibe, heavy drums and sludgy guitars. It's an epic. Next is "Something Else", which is just as it says. This one is way faster and lighter, sort of; it has some angry vocals and then a spacey guitar part takes over, sending everything to some kind of orbit. It sounds like Nervosas mixed with Thee Oh Sees. I really like the guitar part at the end. "Dylar", the title track, has some scary vocals. I didn't know what Dylar was, so I looked it up and read a bit about it. It turns out to be a drug that is intended to inhibit the fear of death in the novel White Noise. These screams on here make a lot of sense. "Her Favorite Song" sounds like Dinosaur Jr. mixed with Pink Floyd. The band makes another space trip at the end, accompanied with really interesting drums and a good solo. "I swear she put a spell on me", begins "The Witch". The vocals are mighty and dramatic, and there should be more vocals and less instrumentals. This track really makes me wish the vocals were more prominent on the other tracks. "Away to Drown" opens with a guy talking about skating. It made me think of playing Tony Hawk's Pro Skater with friends, and I laughed a little. It might have been a real story though. "Away to Drown" is again lighter and faster and angrier. Bat Zuppel moves like a machine in overdrive here, the lyrics are dark, at least the ones I can make out. At a little after the halfway mark, there is another space trip type like in the last few songs. "Living Without Blues" is something I never thought of; it's actually a really interesting idea, though I don't think I would like that world. It's about missing someone and feeling like you've lost it all, though again the lyrics are so reverb'd out at times. There are some really bluesy guitar solos here, mixed with "Lucy in the Sky with Diamonds" chorus vocals, and it's great. "Sneaky Tack" is total garage rock, sped up and cleaned up. "See my girl, see my baby". The vocals make it sound a bit like Bowie on Pinups. I wish this track did not have the space-solo during the second half; the strong would have been stronger as something more compact. "Love" has a tough vocal to start things off, a descendant of Lou Reed or a version of Jet that isn't terrible. I like the cleaner production on this one and the simple imagery. The song ends on a space voyage, as you might expect. Dylar was an interesting listen. The songs are decent, and the instruments are well played. The production is really muddy though, so it can be hard to make out what's going on. It kind of works with this band. I can't understand the vocals on most of these tracks, and I wish I could. They've gone into the world of reverberations. The songs are a little formulaic; Bat Zuppel's garagey guitars mix with the outer limits often. Most tracks seem to have a space rock outro or ending solo. They sound good, but this is such a dramatic effect that it becomes overdone when used this often. Even with these flaws, I do like this album; it's a solid rocker with some cool quirks. I give it a Good, though it just makes the pass. I had to think, "would I enjoy listening to this over and over?". The answer is, "yes". Dylan launches on September 22nd on Wild Kindness Records, and there's a release show scheduled for September 15th at Spirit. Watch for it all overhead.